La Bonne Table is a new addition to the ever-exciting East Coast enclave. Bringing homecooked French flair to this area where none has existed thus far. 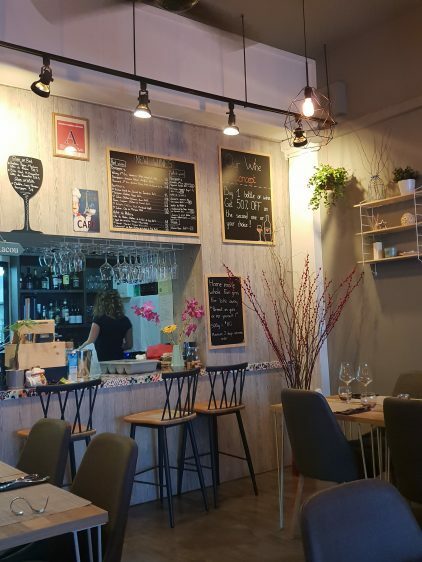 Opened by the husband and wife team of Manon and Andrea, who come from the South of France, the restaurant clearly references the charming décor of a pretty countryside house in a little French village. 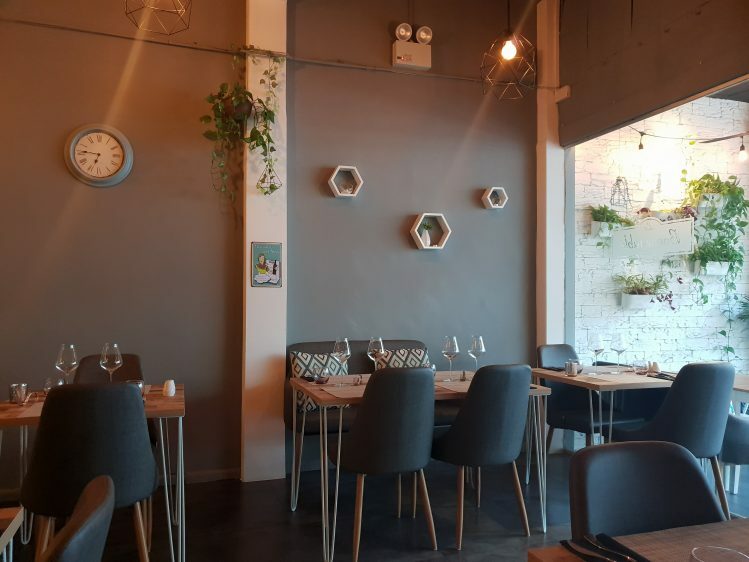 Potted plants along the walls, a sweet blue and grey themed décor and understated, rustic wooden tables effortlessly put you at ease – it does feel like being at a friend’s place. The menu, interestingly, isn’t all French though. 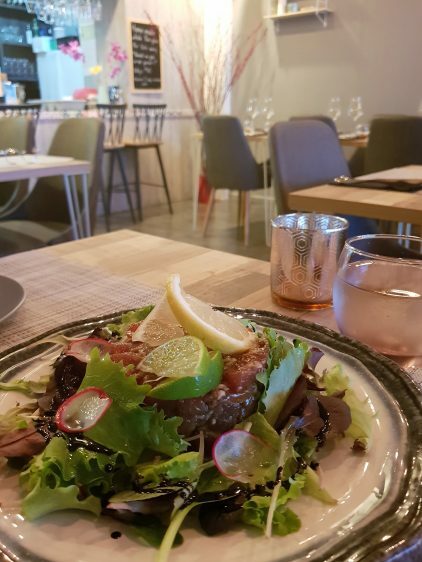 I will admit I had my doubts when I saw La Bonne Table’s menu online, I wasn’t sure why there was pizza and pasta on the table. Well, pasta maybe, but I cannot recall a time when I had pizza at a typically French restaurant. 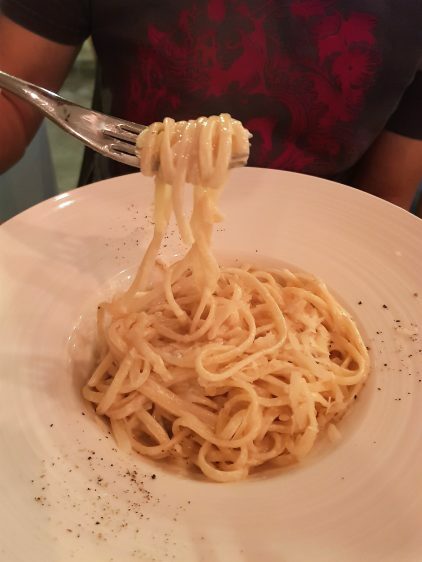 But at La Bonne Table, this is due to one half of the team being Italian – the hubby half. Our shared appetizer was the Tuna Tartare ($21.50). I like that the tuna was cut chunky, not too minced, and held its shape well. I also like the not too overpowering acidity that came with the fish, which by the way featured a homemade strawberry balsamic cream. The portion is definitely good as a shared starter. Husband pondered between steak and a pasta, and chose the 5-cheese Pasta ($27) in the end. Looking very simple, but very homey, the pasta sauce comprised mozzarella, parmesan, gorgonzola, emmental and mascarpone. You might be tempted to think that the portion was just the little bit on the small side, but with such creaminess, I think it’s just right. 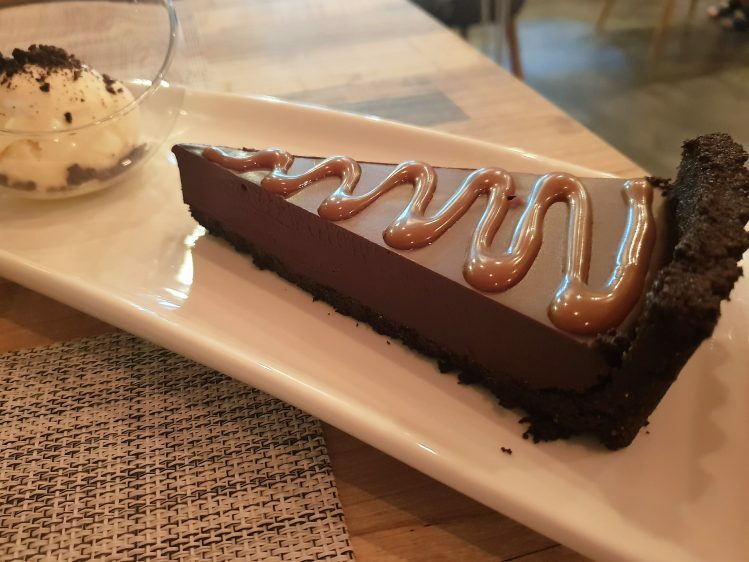 After all, you’d want to save room for dessert, no? 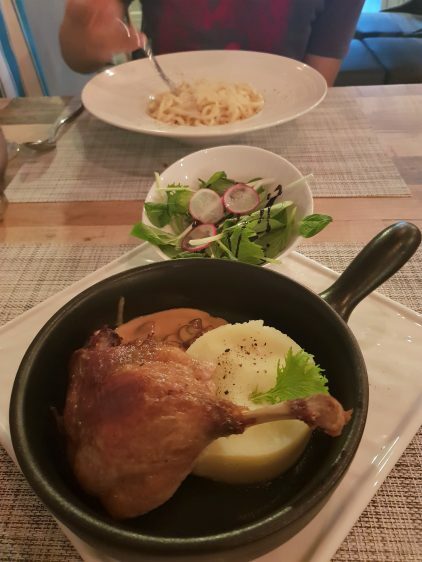 Naturally, I had to try one of my favourite French classics, the Duck Confit ($23). Now, asides from judging the dish by how moist the meat is, one must also check on the crispiness of the skin. 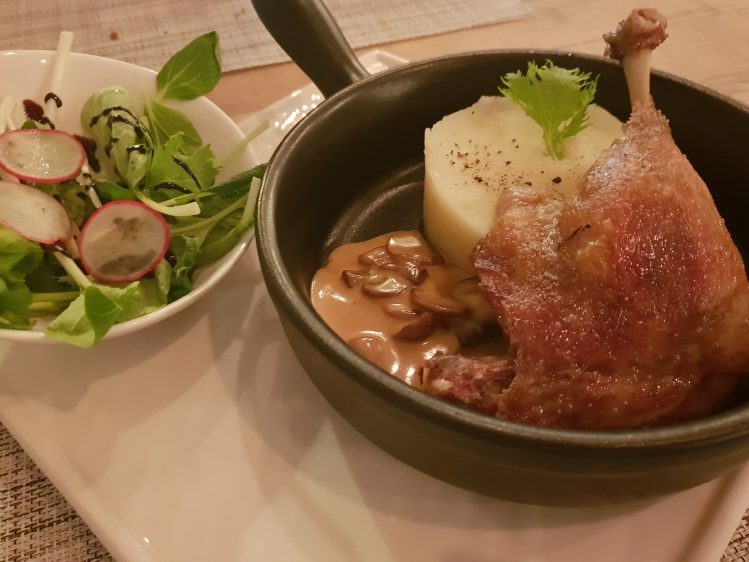 At La Bonne Table, the skin was crisp, though on some parts, the fat could have been rendered further for more crisp. Now, for both dishes, the salt level was kept low, resulting in my reaching for the table-side salt (which I never usually do). But I figured it was a case of them acceding to Singaporeans’ preference for less salt. I’ve noticed this especially at Spanish restaurants where the norm is to be rather heavy handed with the salt, and I know many restaurants that have had to tone it down to match our palates. And this was pretty much what the owner said as well. Save room for the tart! This time, we had enough space in our tummies for dessert and while the dessert of the day, a Cherry Tart sounded compelling, I wanted to stick to chocolate, hence the Chocolate Tart ($14). Now, this was a big and wonderfully decadent slice of heaven! So rich, so dark, and just so yum. I even checked if they would sell the whole tart. They haven’t done so yet, but if there are requests, they could and it would be $60 or so. 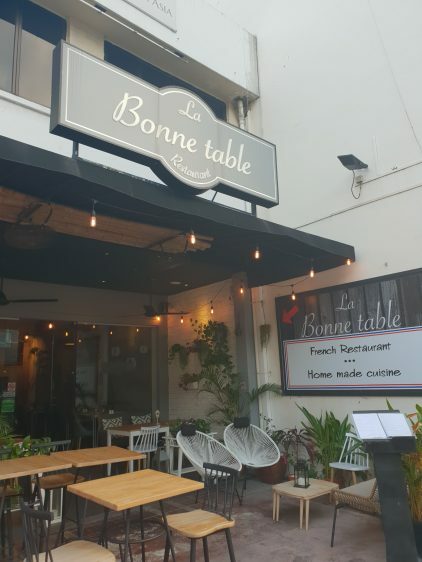 So, Katong now has an authentic French bistro now, and I would certainly be making my way back to La Bonne Table someday soon!